If you're anything like us, freshening up our bathroom countertop organization might be long overdue. As one of the places used most frequently in your home, it quickly gets cluttered and disorganized as a result. Soon, your oasis of organized makeup, jewelry and accessories is splayed out every which way. But, you can fix the problem and save time every morning with these go-to products that make keeping a system of organization easy! Get some ideas on how you can use them, below. 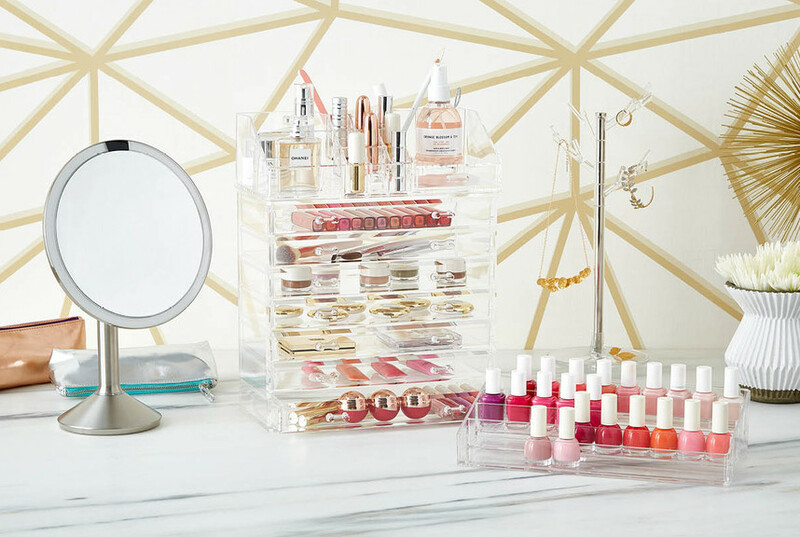 Organizing and storing your entire makeup collection without eliminating all usable countertop space IS possible - you just need the right products. Our 7-Drawer Premium Acrylic Chest does just that. It's built to be roomy while still taking up a small space footprint, so no matter what you clear out or add to, this chest can fit to it. The clear acrylic construction helps blend into its surroundings and the smooth gliding drawers make it easy to access anything inside. 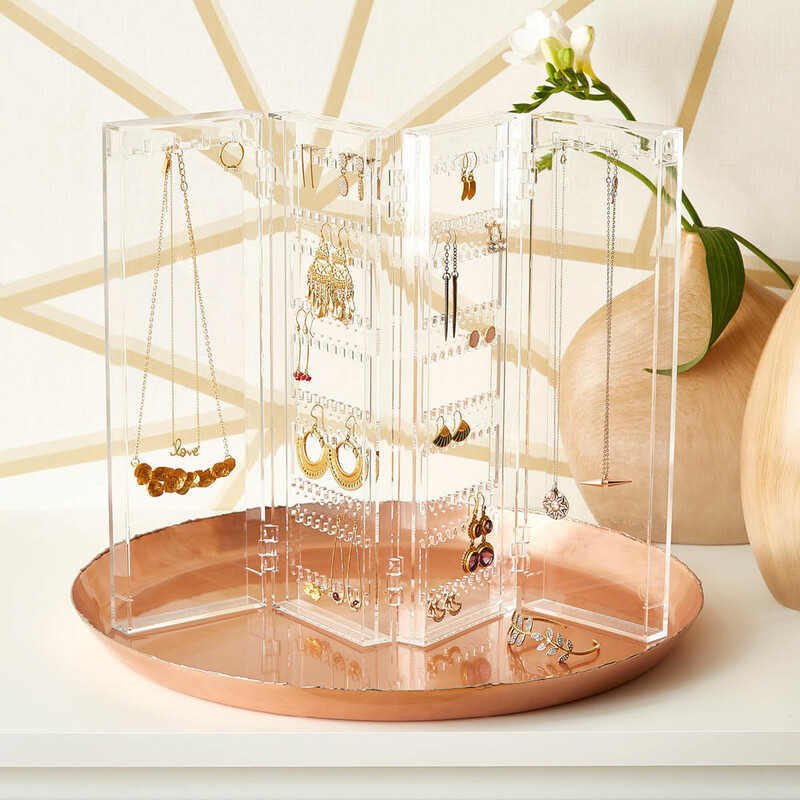 Keep your jewelry collection on display and free from tangles with our Acrylic Folding Jewelry Screen. It securely stores earrings and necklaces on generously sized panels so you can find what you're looking for quickly and easily. A wide base ensures it stays exactly where you place it without tipping over, and an accordion design allows it to fold completely. If you're lacking countertop space but you've got a bevy of drawers, think about organizing them with this smart almost one-size-fits-all solution. Our Stackers Large Expandable Jewelry Storage Tray expands from 15-3/4" to 26-1/4" so it can fit perfectly in practically any drawer. The plush velvet covering and the many compartments make it a smart product for any jewelry organization need. 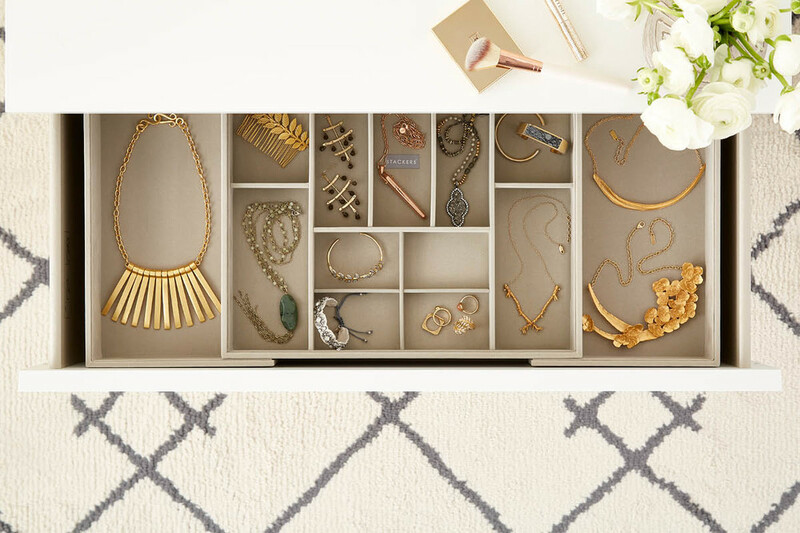 We hope you've found a few solutions to help get your makeup and jewelry organization back on track. Let us know how you organize it all in the comments below!